First of all, drive courteously and always obey the law. Never drive aggressively, joy ride or drive under the influence. Be attentive. Avoid distractions, such as texting, and always yield to pedestrians. Adjust your speed for inclement weather, and avoid sudden starts and stops when the roads are slick. Avoid driving in storms. Golf carts will not protect you from a lightning strike. Only transport the recommended number of passengers for your golf cart. Equip your golf car with seatbelts and require all of your passengers to wear them. Use hand signals as well as your turn signal when turning so that your intent is very clear. Keep body parts inside the cart while the vehicle is in motion unless you are signaling. Never make a left turn from the golf cart lane. Instead, merge into the lane from which you plan to turn. Check your blind spots before turning, and carefully check behind you before backing up. When you park and are planning to leave your cart unattended, set your parking brake and take your keys. And enjoy the ride. 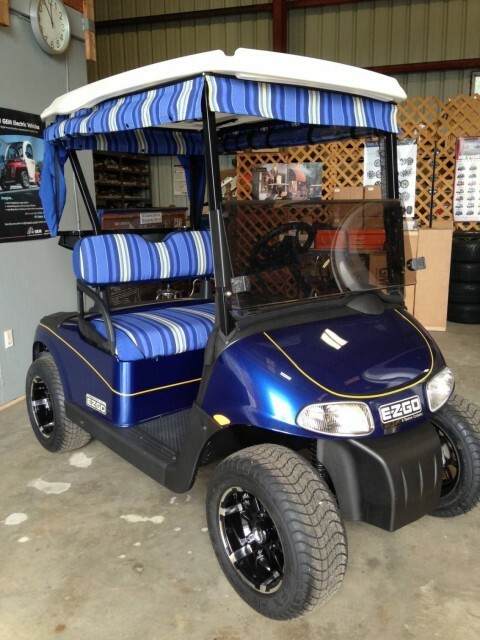 Golf carts can be loads of fun and very convenient when safety is in play.